So here's my take on kombucha. After reading about some good reviews of kombucha, I decided to try it. It's a fermented, fizzy, tea-like drink made with bacteria. The first time I tried it was several months ago. 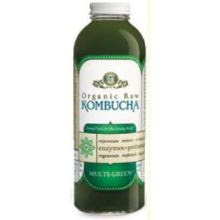 I had GT's raw kombucha drink, the multi-green variety. I tried it, and likened it to bitter tasting beer without the alcohol. Not very pleasant, but the bottle says it has many health benefits, like improving digestion or immunity. But recently, I found an article on msnbc that explains there have been no tests to prove the benefits of drinking kombucha. Also it says it can make people sick with weak immune systems or if you drink it too often. I decided to try it again, this time going with a different brand and a different flavor. It was High Country's organic live kombucha in goji berry flavor. Unfortunately, the taste was about the same as the first one. I strained to try to find the berry flavor, but didn't find any. And at over $3 a bottle, I don't think I'll be buying any more kombucha. Once the painters are done painting our kitchen, I think I'll bake something! Aww, I'm sorry you didn't like it, I guess it's not for everyone...as for health benefits it does have several B vitamins which are hard to come by for vegetarians. $3 a bottle -- yikes! Pass. Have fun baking! Don't give up on GT's just yet! Try one of the other flavors, like strawberry, mango, or guava. Those ones are far more palatable because they a definite fruity flavor and don't have the grittiness like the multi-green does. I've never like HIgh Country, but Katalyst is pretty good, though it's not as strong as GT's. I love kombucha! !